Because of the hundreds of spam comments we have been getting here on the Western Bitters News I have had to change the settings for the comment procedure. You will have to have a google account and sign into it before you can comment on the posts. I hate to have to do this because I believe that everyone has the right to speak their mind without restrictions. But as always there are those that abuse our rights. I am sorry about the change but I don't have the time to wade through hundreds of comments that try to lure you into opening a link that can infect your computer. Not sure about how you folks feel but when I want my bottles spinning I get into the tequila bottle. This years display will feature Gold Rush and western soda and mineral water bottles. We are looking for folks to bring their sodas to display in our secure display cabinets for everyone attending the show to enjoy. Come on now....Grab a few of your favorite sodas and bring on up to Downieville for everyone to enjoy. 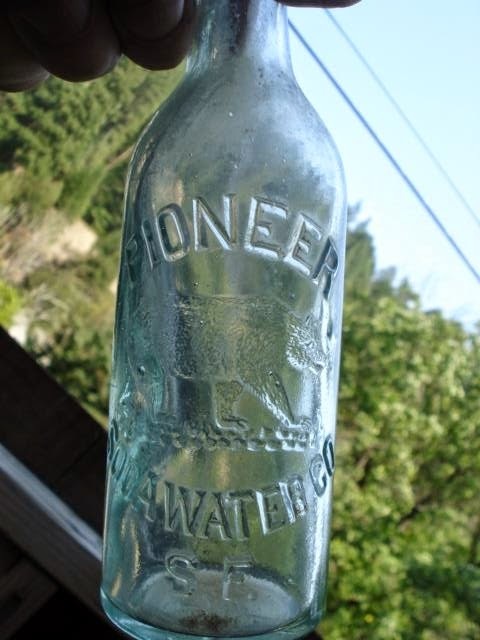 For a while now I have been searching for a Turner Dairy bottle from Sierra County. I finally located one a few weeks ago and was happy to have acquired it. The Turner Family have been in the ranching business since at least the 1880's and a quote from the Sinnott book "Downieville - Gold Town on the Yuba" confirms that "In the 1880's H.K. Turner of Sierra Valley was supplying Sierra City and Downieville with fresh butter" Today the Turner family raise cattle in the sleepy little area of the Sierra Valley known as Sattley. Sattley has probably a couple dozen or three folks living in the general area of what was once a thriving community. An interesting sidelight to this bottle is the reference to Camp Pioneer on the reverse side of the bottle with the map. 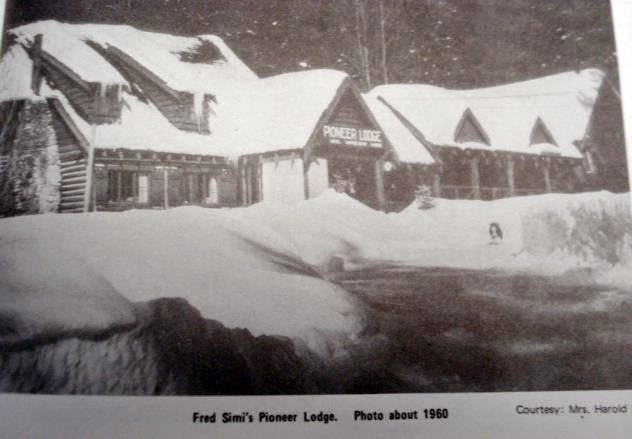 Pioneer Lodge was located about 10 miles above Sierra City on highway 49 and run by an old codger by the name of Fred Simi. I have been going through an old collection which was all dug in San Francisco, and Nevada. While going through boxes of flasks, I came across this seemingly western little half pint with an applied top. The base embossing on this one was a bit of a surprise as I have not seen the initials "C.C.G. Co." before. Maybe I just have not looked but I was hoping someone could shed some light on this glass house. 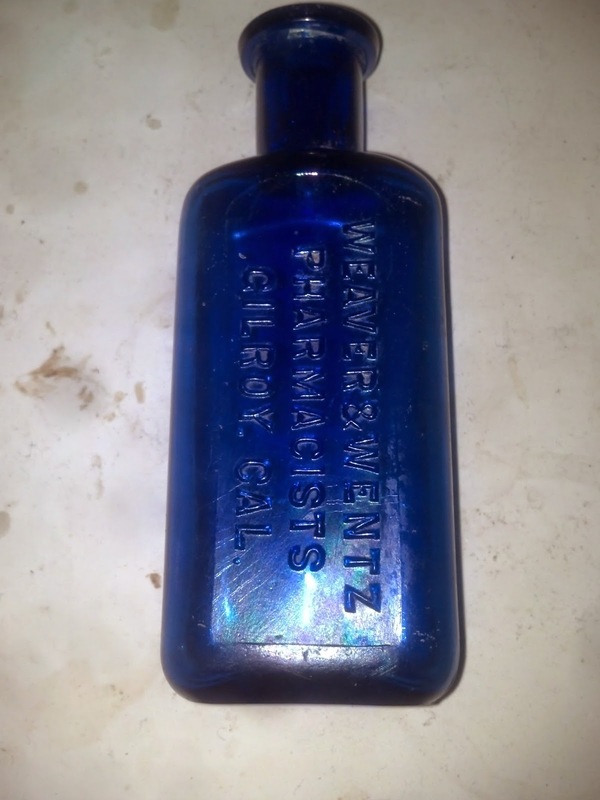 Anyone have any information on this pharmacy? Thanks to all of our readers and contributors that made it possible to reach one million page views. 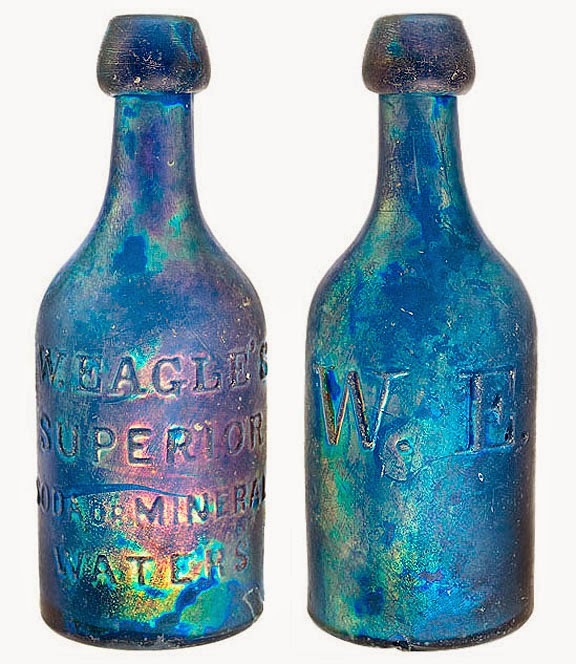 Lots more articles and posts on the bottle collecting hobby to come on the Western Bitters News! B.B. Thayer Apothecaries, San Francisco. Here is a recent find, that I thought I would post today. There have been a few postings on the B.B. 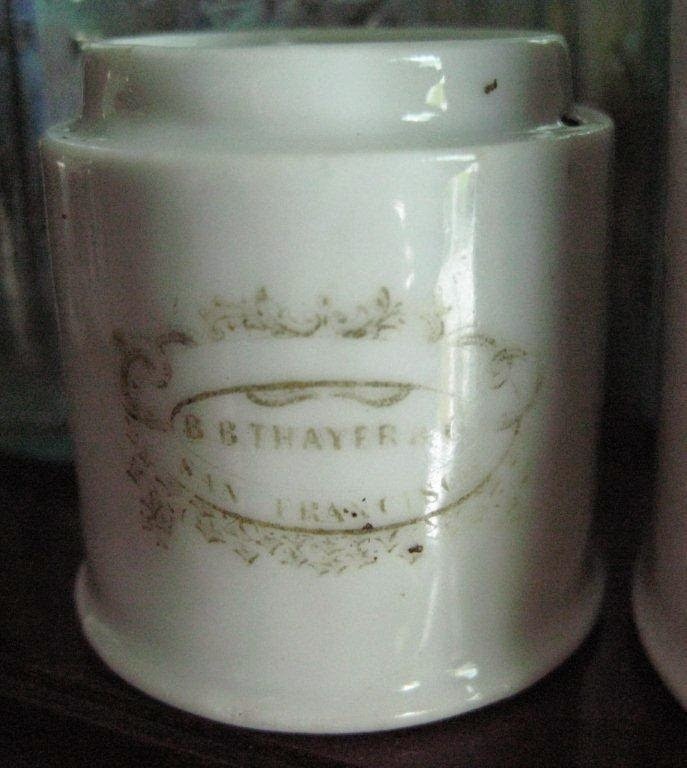 Thayer company, and his prattware containers. This is the first one I have seen with it's original lid. This one has gold stenciling on the pot and lid. Anyone out there who can date this piece? I also have a small size pot without the lid. These are great pieces of San Francisco history. 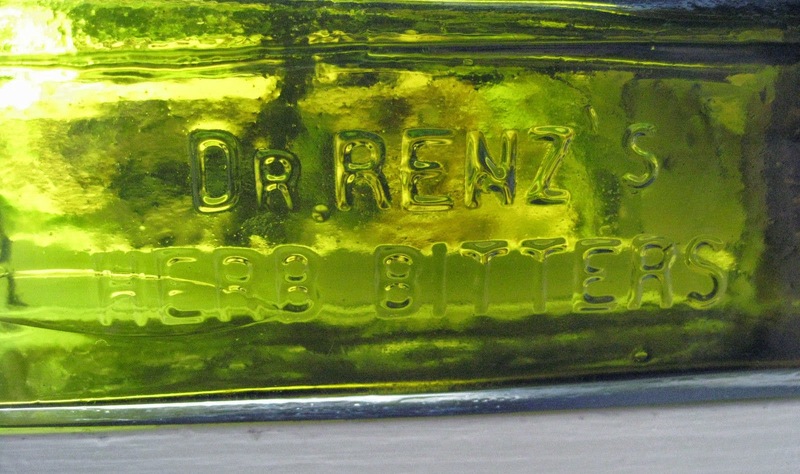 Dale M.
I just noticed a very nice example of the first variant of the Dr. Renz's Herb Bitters up for auction on ebay. This example of the earliest Renz is a beautiful yellow green and described as being in "near mint" condition. 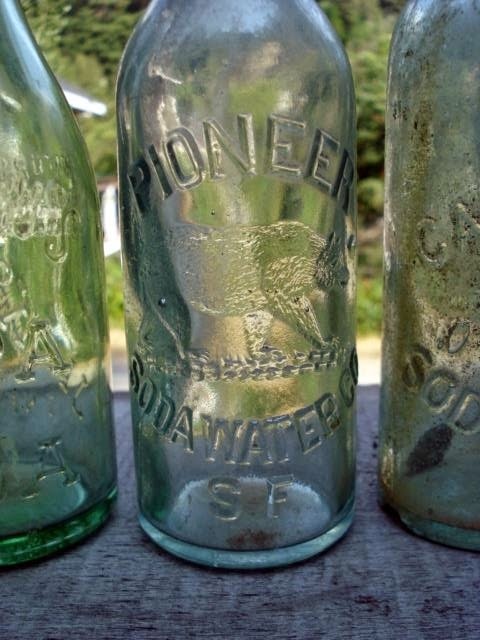 Quite a few years ago my old digging buddy Bob Kaiser and I stumbled across a few turn of the century soda bottles next to a building that once housed the Downieville Soda Works. I say stumbled but what we really did was dig beneath and beside a building that I was working on. 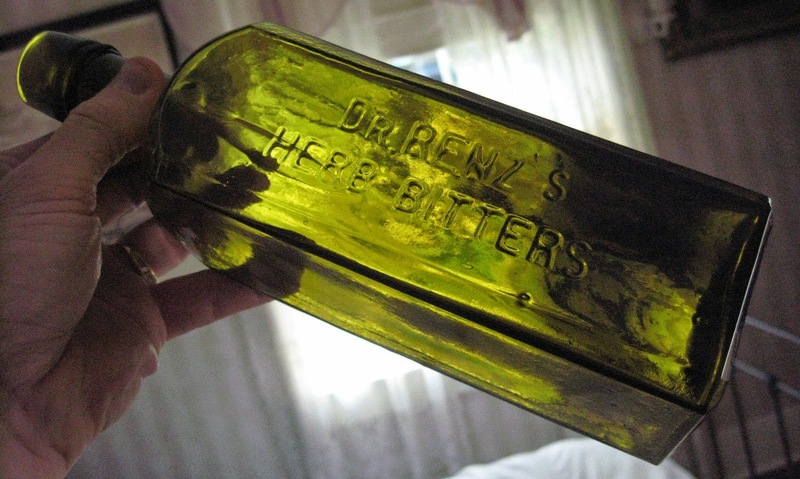 If memory serves we found some embossed hutch style bottles from other cities and even a Truckee hutch but nothing that was embossed Downieville. All in all nothing to write home about but a fun few bottles to find and a pleasant morning surprise. 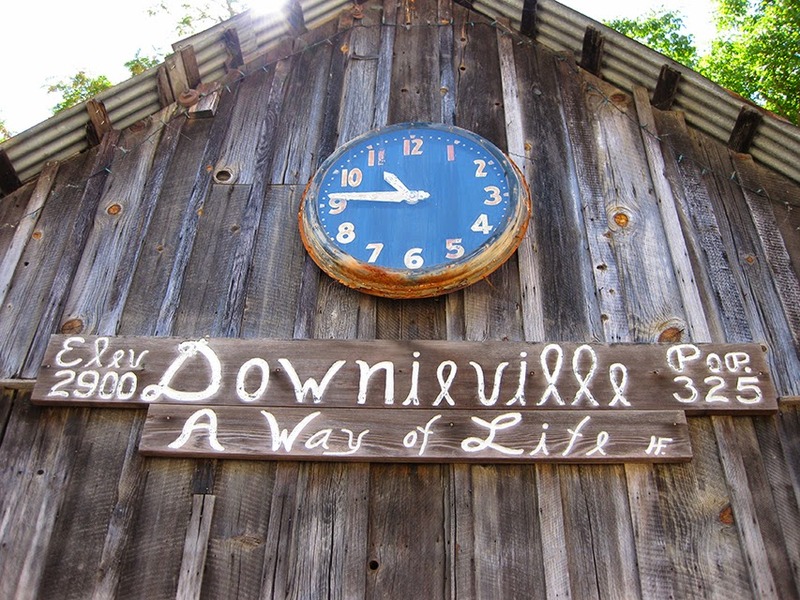 Seems like Downieville, during the 1890's to 1930's, was a poor over the hill mining town. 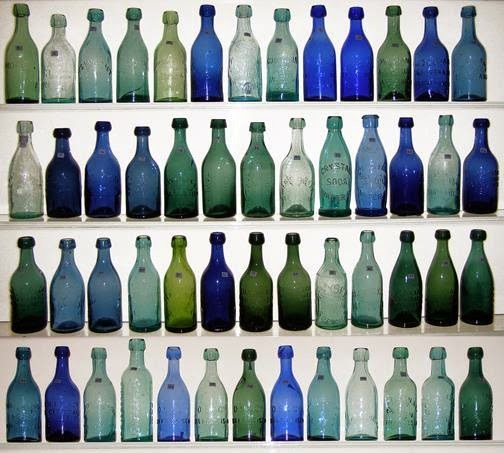 Heck, merchants in town couldn't afford to have a bottle manufactured to bottle their soda in so they gathered what soda bottles they could get their hands on. filled em' up, slapped a paper label over the embossing and peddled them to the locals. 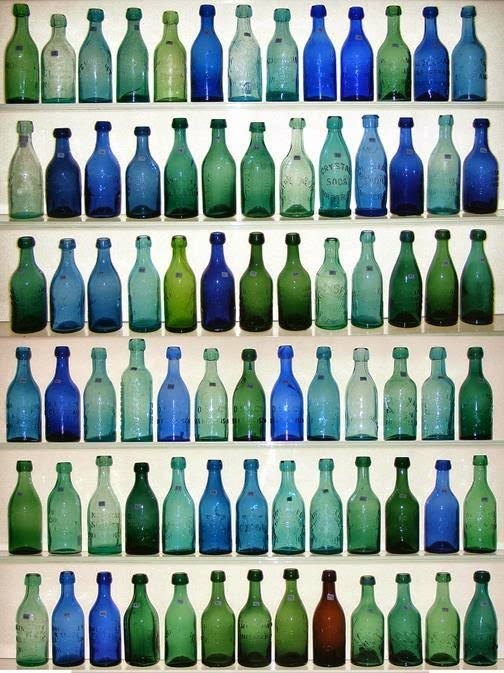 These few bottles and the old soda works spot sure brought back some memory's of the good old days digging in the Downieville area with Bob and the gang. 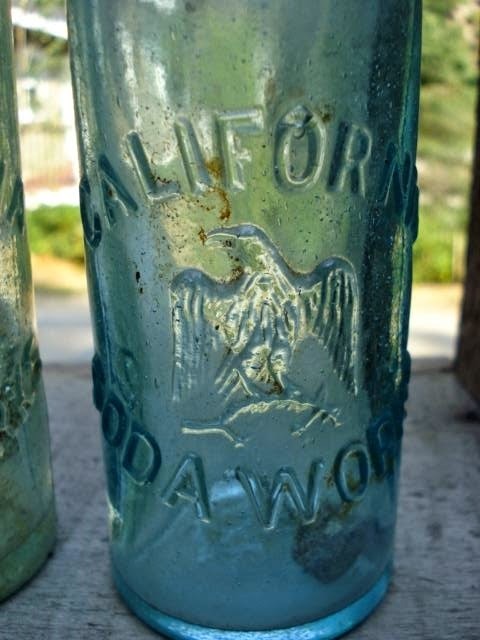 I picked these pictures off of another blog site and was intrigued by the overall stain on a supposed western manufactured bottle. Seems I remember a lot of the comments on western vs. eastern was the overall majority of folks believed you could tell a western piece of glass by the pristine condition of the glass after being buried for years. Now I'm not the kind of guy that grabs a tiger by the tail but..... 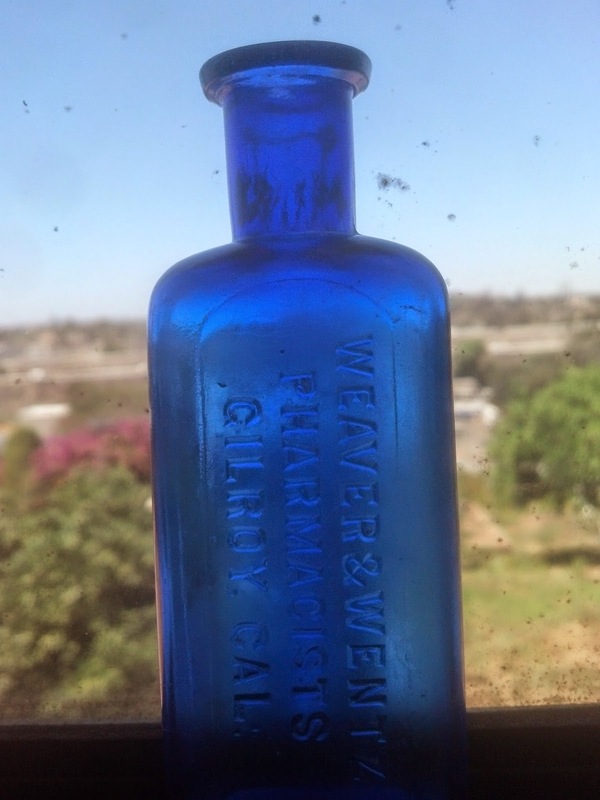 If this bottle is western it sure doesn't look pristine to me! 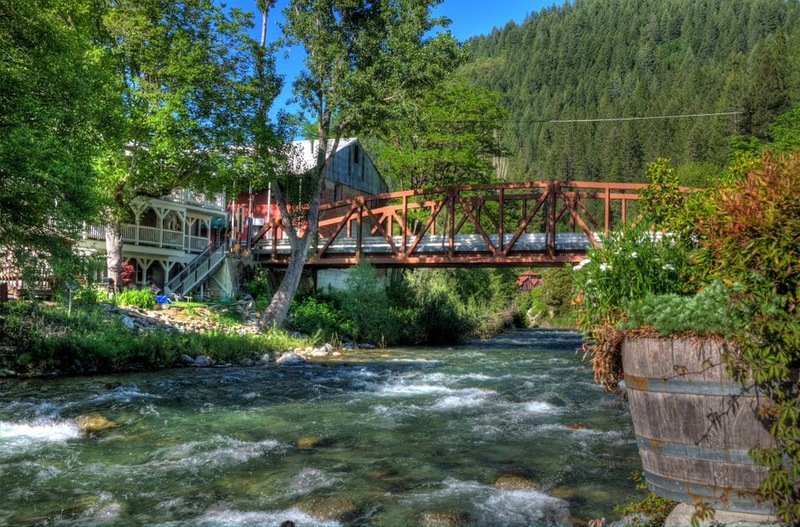 Hope to See You in Downieville!